1.9 How To Apply For The CG TET Notification 2019? Candidates can apply for the CG TET Notification 2019 only through online mode. The higher authorities had released the Board of Secondary Education Chhattisgarh Notification 2019 for the various Teacher posts. Applicants who are interested in cgvyapam.choice.gov.in teacher jobs they can start filling the application forms from 17th January 2019 to 3rd Febraury 2019. And Entrance Examination Date will be 24th Febraury 2019. We had also provided you with the specific information such as eligibility criteria, application fee, important dates, salary details, others. Candidates who are interested to apply for this job, they can check the information about the educational details for CG TET Notification 2019 from this section. The applicants should have passed 12th or its equivalent along with 50% marks with 2- year Diploma in Education (Special Education). The candidate has 4- year B.El.Ed (Bachelor of Elementary Education) those can apply. Candidates with graduation degree with 50% marks or a B.Ed are also eligible to apply. The Candidates should have a graduation degree like B.A./B.Sc./D.Ed with at least 50% marks and must have B.Ed Degree. The Appearing candidates 4- year Bachelor in Elementary Education (B.El.Ed) is also eligible for apply. The Selection Process For CG TET Vacancies 2019 will be specified by the higher authorities of the Board of Secondary Education Chhattisgarh to select the suitable, talented, merit, and dynamic candidates for the Teacher posts. Candidates can also check the CG TET Notification 2019 for more information. Candidates can check the CG TET Notification 2019 for salary details. How To Apply For The CG TET Notification 2019? Furthermore, candidates need to check the below set of instructions to apply for the CG TET Notification 2019. We heard that many of the applicants were worrying during the form filling process. So, we kept that in mind and provided these steps. Follow them and then apply appropriately. 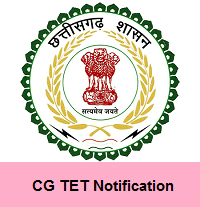 In that many links are there, you can search for the CG TET Notification 2019 link. Again you click the 3rd link then open the notification for CG TET Notification 2019. Read the notification carefully, if you are eligible then apply the CG TET Notification 2019. Once verify all information of the application form. Take two or more copies of the CG TET Notification 2019 application form for future reference. Like all the information is given about the CG TET Notification 2019? then, stay tuned to us on our Sarkari Recruitment for such updated information. Moreover, you can also ask us for any doubt or even you can leave your comment in the below section of this article.